InnoGear upgraded solar post light with modern design fit perfectly on your 4 x 4 or 6 x 6 inch wooden post. They cast a very nice light immediately around them. They are not dazzling bright, but if you are looking for classy solar lights to pretty up the yard, these are them. Using upgraded monocrystalline silicone solar panel, it has the highest efficiency rates converting sunlight into electricity. It auto lights on in the evening and auto lights off in the morning. 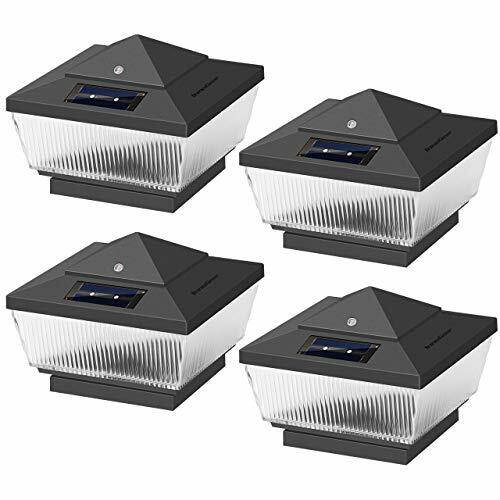 These solar lights are perfect for adding illumination, distinction, and increased outdoor enjoyment. Keep debris and snow off the solar panel to allow the battery to recharge. If the panel has been covered by snow for a long period of time, allow the battery to recharge by allowing the panel to receive full sunlight for at least 10-12 hours. Upgraded Monocrystalline Silicone Solar Panel: This solar light has the highest efficiency rates converting more than 22% of sunlight into electricity. Perfect Post Size Fitting: Solar light measures 3.78x3.78 inches, easily fits on top of any 4 x 4 inches wooden post. They can also rest securely on any flat surface. Make your home shine: Comes as a set of 4 lights, an easy and affordable way to add an up-scale aesthetic to your property and make your home stand apart. Warm White and Auto on/off: Warm white light creates a relaxing and welcome home feeling, it auto lights on at dusk and auto lights off at dawn. Durable Construction: Waterproof, heatproof, it can stay in place well and handle a good mount of wind, rain and snow.